Entering the game, rookie seventh-round pick Kurt Coleman likely to make the 53-man roster. After tonight's performance, he is a virtual lock to make the club. Not once, but twice Coleman returned a fumble for a touchdown. 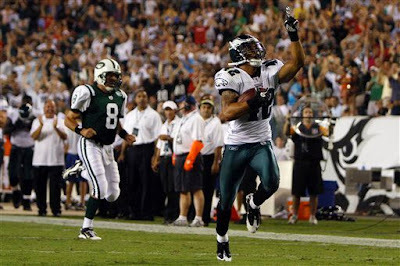 The first time came at the end of the first quarter, when he picked up and ran rookie RB Joe McKnight’s fumble for a 64-yard touchdown. Then the following quarter with under a minute left, Coleman returned a John Conner fumble 8 yards for another touchdown. While Coleman shined and contributed 14 points, the Eagles offense struggled to put up any points. Michael Vick started the game for the first time in four years (ironic his last start came in Philadelphia). However his night was short-lived as he played only two series. In those two series, he led the Eagles to a field goal and a 3-0 lead. As for third-string QB Mike Kafka, he struggled to complete passes and sustain drives. Ultimately, he finished the night 9-27 for 76 yards with an interception and zero touchdowns. His 29 percent passer rating was not the only thing that stunk on offense for the Eagles, as the running game was nonexistent. RBs J.J. Arrington and Martell Mallett combined for 14 carries and only 39 yards. Eldra Buckely, the leader in the clubhouse for the third running back position, had just two carries for 12 yards. Since head coach Andy Reid only gave him two carries, it could mean he already won the job. Nevertheless, the defense managed to keep the Eagles infront 17-14 until early in the fourth quarter. 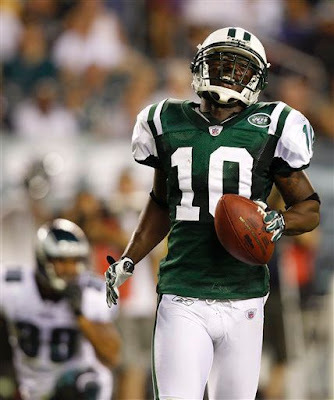 Just 43 seconds into the fourth quarter, Jets backup QB Mark Brunell hit Super Bowl MVP Santonio Holmes on a 51-yard touchdown pass to give the Jets a 21-17 lead and eventually the win. The crafty veteran quarterback finished the game 11 of 17 for 118 yards and two touchdowns. Even though the Eagles lost and the offense looked miserable, there were some positives to come out of the game besides the play of Coleman. First, the Eagles and their fans did not know what to expect when they traded for CB Jorrick Calvin earlier in the week. Without a doubt he did not have his best game at cornerback, but he was physical on the outside with receivers and even caused a fumble that could have changed the outcome of the game (if recovered by the Eagles defense). In addition, Calvin demonstrated his return skills as he returned two punts for 25 yards (12.5 average) and two kickoffs for 56 yards (28 yard average). Furthermore, he is proving that he is worthy of making the Eagles practice squad. Calvin and Coleman were not the only players on defense that were making plays on Thursday night, linebacker Moise Fokou recorded 11 tackles with nine of them being solo. Moreover, defensive coordinator Sean McDermott allowed him to showcase his speed and rush the passer as he registered a QB hurry. Remember it was not too long ago that the Eagles' coaching staff believed he was going to be the starting SAM linebacker. Another positive to come out of this game was rookie CB Trevard Lindley. Lindley continues to look like the real deal for the Eagles at cornerback. He did not do anything great or spectacular tonight, but he is rarely out of position and knows how to make a tackle. More importantly, he has an ability to read a quarterback’s eyes before the ball is thrown and create a turnover. Eventually, he could unseat CB Joselio Hanson for the starting nickel cornerback spot. On the other hand, FS Quintin Demps and CB/FS Macho Harris came up small and did nothing to deserve a roster spot. Both were fighting for their jobs tonight and neither made a big impact on the game. One of them is going to make the Eagles 53-man roster as the fourth safety, but neither really deserves it. Also, DE Darryl Tapp continues to disappoint after being traded to Philadelphia and signing a hefty extension. The box score will show that he had three tackles, but he rarely got pressure or touched the quarterback tonight (and all preseason). Tapp is a lock to make the roster, but that is only due to the signing bonus he received. The Eagles thought they were trading away an overpaid defensive end in Chris Clemmons for Tapp, but now it seems like they have acquired the same player and paid him even more. Nevertheless, the game will not be matter to most fans or the national media tomorrow. However all the positives and negatives coming out of this game will be significant as the Eagles cut the roster from 75 players to the mandatory 53 on Saturday.